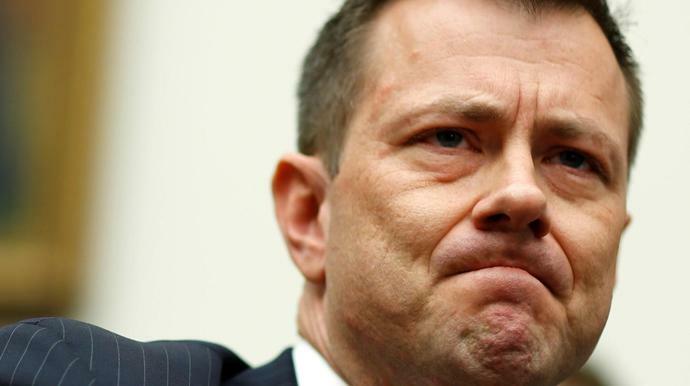 Supporters of fired FBI agent Peter Strzok rallied to his side on Monday and donated nearly $200,000 on GoFundMe in just 15 hours. The current goal is $350,000. Strzok was fired Monday, ending a 22-year career with the bureau, for sending texts to FBI lawyer and girlfriend Lisa Page that were critical of Donald Trump while working on special counsel Robert Mueller's team. He lost his job despite recommendations from the FBI's Office of Professional Responsibility that he be demoted instead. The decision to fire Strzok should be "deeply troubling to all Americans," said his attorney Aitan Goelman. "A lengthy investigation and multiple rounds of Congressional testimony failed to produce a shred of evidence that Special Agent Strzok's personal views ever affected his work." The money will be kept in a "trust dedicated to covering Pete's hefty - and growing - legal costs and his lost income." As of early Tuesday, more than 4,800 people had donated to the fund.